Pucci neckerchiefs from Neiman Marcus are $50 during World Festival. Below are Jimmy Choo and Salvatore Ferragamo, bottom, exclusive handbags. While some enjoy the World Festival because of its fashion shows, and some seek makeup advice and makeovers, others show up for the get, the availability of exclusive, collectible merchandise available only for Hawaii's market. » Bally: Only 50 World Festival handbags ($495) were created for this event. » Bobby Jones: World Festival special edition "13 Players" drivers ($450) were created to commemorate the 13 major golf championships won by the boutique's namesake. Each 10.5 degree driver has a charcoal finish head and a super-premium, ultra-lightweight 40-gram shaft. Every driver is personally signed and numbered by Bobby Jones' master designer, Jesse Ortiz. Also created for the festival are limited quantities of the Bobby Jones navy Hamptons club bags ($195) and cotton golf caps ($39.50), embroidered with the Player and World Festival logos. Cotton canvas Hamptons weekender bags ($160) and cotton canvas Hamptons shoe bags ($60) also will be available. » Burberry: Is featuring its 150th Anniversary Watch ($695), made in Switzerland, with a black calf-skin leather strap, stainless steel case and silver-colored dial with etched check. » Cartier: Has created an 18K rose gold mini "LOVE" bracelet on an orange silk cord ($475). This special-edition charity bracelet will support Kapiolani Children's Miracle Network. For each bracelet sold, Cartier will donate $100 to KCMN, where all funding stays in Hawaii to benefit and help Hawaii's children. » Jimmy Choo: Is offering the Rock handbag ($1,450), made of cream pearlized soft goat leather with a woven metallic nappa leather strap in bronze, gold and mandarin with a World Festival 2006 plaque inside. A limited edition of just 25 handbags is available. » Coach: The company's president and chief creative director, Reed Krakoff, created 100 limited-edition Legacy Satchel ($698) in Geranium leather and antique brass hardware for the festival. » Dior: The company is launching a new "Dior Hawaii" jewelry collection and an exclusive line of small leather goods including a phone/camera strap, a shoulder strap pouch and a heart-shaped key chain, all worldwide exclusives available only at the Ala Moana boutique. Also, 250 limited-edition logo jacquard medium hobo bags ($595) with pink patent leather trim and enamel ID plate named "Diorissimo" will be available. For fashionable youngsters, exclusive "Baby Dior Hawaii" T-shirts ($85 to $110) include a pink metallic shirt with a beaded hibiscus print for girls, and a blue tiki embroidered print for boys, in children's sizes 2 to 12. » Fendi: Is offering a limited-edition handbag named the "FF Fendi Festival" bag ($395). A chic "day to evening" shoulder bag, the traditional brown FF zucchino material has been re-imagined in a bright red and detailed with red velvet trim. A red patent leather shoulder strap will bear the World Festival label. 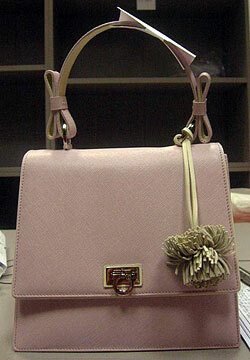 » Salvatore Ferragamo: Is offering a limited number of updated mini Kelly bag ($900) in cipria pink Saffiano pebble calf with magnolia white Saffiano trim, created for Ala Moana Center and available only in Hawaii. 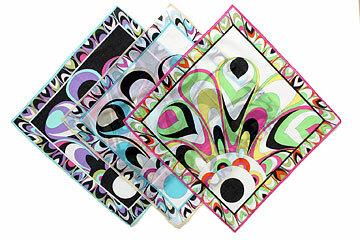 » Neiman Marcus: Partnering with designers Pucci and Lizzie Scheck, the luxury retailer is offering 18-inch "Farfalle" print neckerchiefs ($50) in three color variations -- fuchsia, violet or sky. Lizzie Scheck has created an exclusive necklace featuring a mini flower pendant in white gold necklace with pave diamonds ($295). » Theory: New to the center, the boutique is participating in its first World Festival by designing a special-limited edition Bianca Bag ($125). Only 50 small, elba leather evening bags with a detachable chain strap were created. » World Festival "Fashion Showcase": Fashion show of World Festival exclusive merchandise, fashion and a special appearance by one of Japan's top models, Shiho, will highlight this event, also featuring Steve Kemble from "Whose Wedding Is It Anyway?" At 2:30 p.m. on Centerstage. » Dior: "Show Artist" Thuy Pham will conduct in-store makeovers by appointment only from 11 a.m. to 5 p.m. Call 943-6900. Repeats Friday. » Hermès: Guests will be able to watch craftsmen from the Hermès atelier in Lyons, France, at work printing "Passage a Paris," an exclusive design created to commemorate the 2006 World Festival, at 2, 4 and 7 p.m. daily through Saturday. The limited-edition collectible scarf is available at both the Ala Moana and Waikiki Hermès stores for $320. » Louis Vuitton: You're the designer during a "special order" exhibition open daily through Sunday. A master craftsman and sketch artist will assist those interested in creating their own made-to-order design. Also shown will be pieces from the Museum of Heritage in Asnières, France. » M.A.C Cosmetics: Holiday Collection launch includes the exclusive M.A.C Silverette ($90), a metallic silver overnight makeup case. Only 100 cases will be available. Three of M.A.C's global artists -- Gregory Arlt, Louise Zizzo and Victor Cembellin -- will be giving demonstrations at 3:30 p.m. on Ala Moana's Centerstage. In-store appointments from 1 to 7 p.m. Friday and Saturday are being taken at 955-0356. » Folli Follie: Enter to win a $500 "Crazy Folli" shopping spree for jewelry, watches and accessories by visiting the store through Sunday (one entry per person). » Celine: A "Boogie Exhibition" will be set up as a tribute to the house's best-selling handbag, "Boogie." Ten Boogie bags will be available for sale during the festival, with pricing to be announced. » Lacoste: Will present a fashion show for men and women at 4 p.m. Friday on Centerstage, in partnership with Vogue magazine. » Harry Winston: An exhibition of jewelry and rare timepieces with "wow" factor will be on view through Sunday. Among items to be shown are a sapphire and diamond necklace featuring a 17-carat center blue sapphire from Sri Lanka, and a ruby and diamond ring with a 3.25-carat cushion-cut ruby from Burma. » Neiman Marcus: Frederic Fekkai stylist Kasai, from the Beverly Hills salon, will be sharing hairstyling tips from noon to 7 p.m. Repeats 10 a.m. to 5 p.m. on Saturday. » Dior Cruise/Spring 2007: Collection will be shown during a runway show at 4 p.m., featuring guest model Shiho. Visit www.AlaMoanaCenter.com/worldfestival or call 955-9517 for more information.